Barloworld recently delivered an electric Hyster forklift truck with Metec loading bridge to beer importer/distributor De Kikvorsch in the Netherlands. The truck is intended to boost De Kikvorsch’s efficiency and productivity. Every day, containers of speciality beers from all around the world are unloaded at De Kikvorsch. Until recently, 20 and 40-ft containers had to be unloaded by hand and piled onto pallets. This was because crates and boxes were not loaded into containers using pallets, as these took up too much room. Manually unloading containers is not only particularly labour intensive, but also extremely physically demanding for employees. Nowadays, boxes and crates arriving in containers from overseas are shipped on pallet-sized slipsheets. The Hyster truck is specially equipped with Griptech, the Dutch RollerForks dealer, RollerForks that allow loads to be lifted without the need for pallets. The special-purpose RollerForks can be slid under the slipsheets. 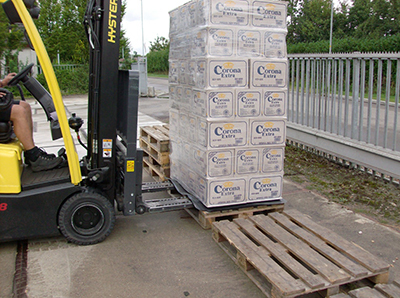 Loads can then be manoeuvred out of the container via the Metec loading bridge and placed on waiting pallets. Pallets are ultimately placed on racks in the warehouse. The JXN forklift truck has a maximum lifting capacity of 1,800 kg at 500 mm. It is fitted with a three-stage VISTA mast that provides good visibility and has a low maximum clearance height that makes it suitable for operations inside containers. The JXN also holds its own on slopes and loading bridges.